“Instructor was clear and concise and easy to follow. Every piece was broken down and organized effectively. I will definitely save this one as a resource for future projects. “I HIGHLY recommend this course. It's also very complete and professionally presented as it covers everything needed to learn the basics of Unity and beyond in an easy to understand manner. If you want to learn the basics of Unity, this is the best course I can recommend to get you well on your way to creating a polished first game, which you actually build as you work through this course. The course is well prepared & presented (high quality audio & video) by an excellent & qualified instructor. He knew what he was teaching and how to teach it. No complaints whatsoever. udemy.com - From absolute beginner to game producer!! “This course will take you from absolute beginner to game producer. It is very complete and I recommend it...well worth the money!!! 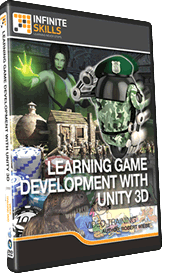 A practical Unity Game Development Training Course, this project-based Learning Game Development With Unity 3D video tutorial series will quickly have you using relevant skills for real-world applications using the Unity 3D game engine. This video series is an introduction to the Unity v4 game engine, for beginners. Practical working files further enhance the learning process and provide a degree of retention that is unmatched by any other form of Learning Unity 3D tutorial, online or offline, so you’ll know the exact steps when working on your own projects. Learning Game Development With Unity 3D – a practical Unity Game Development Training Course that teaches Real World Skills.